>>Provincial Highway 1 Route Direct Bus: Sanchong (Cailiao)←→ MCU Taoyuan Campus (Jiu Jiu Bus) (Bus Schedule) Bus Schedule has changed. 2018/11/1 update. >>Provincial Highway 1 Route: Taoyuan campus → Sanchong Cailiao (Taipei Main Station) (Jiu Jiu Bus) (Bus Schedule)Ticket fare has changed. 2018/11/1 update. >>Provincial Highway 2 Route (Round Way Bus): Taoyuan Campus ←→ Taipei Main Station (Cosmos Hotel Taipei), Taipei Campus (Jian-Tan) (Jiu Jiu Bus) (Bus Schedule) Bus Schedule has changed. 2018/12/18 update. 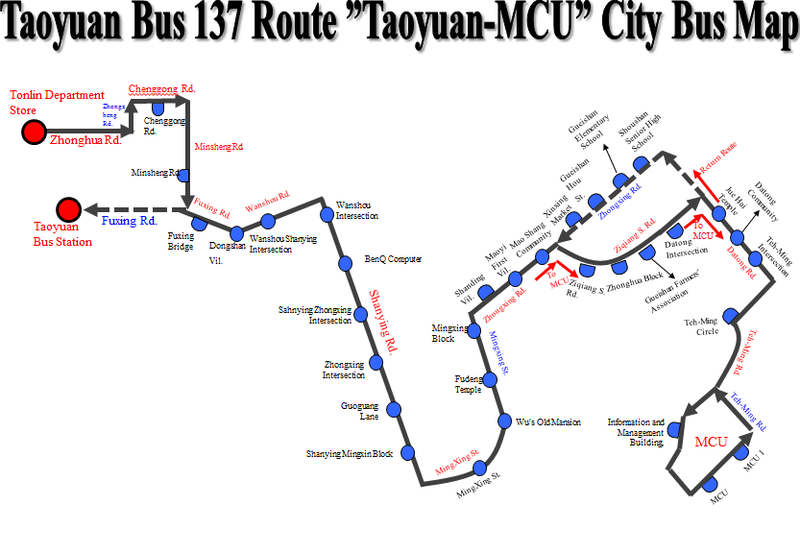 >>MRT Huilong Station Direct Bus: (Taoyuan Bus) (Bus Schedule) Bus Schedule has changed. 2018/12/12 update. >>Zhonghe,Tucheng & Sanxia Route Direct Bus (to Taoyuan Campus): Zhonghe MRT Jingan Station→ Taoyuan Campus (Yi-Tai Bus) (Bus Schedule) Bus Schedule has changed. 2018/09/28 update. Hours of operation for Route 137 bus: Weekdays from 05:45 to 22:20; holidays from 06:00 to 22:20; bus interval of 15 to 25 minutes. Any problem, please contact (03)361-8365, (03)361-9588, Taoyuan Bus Station. 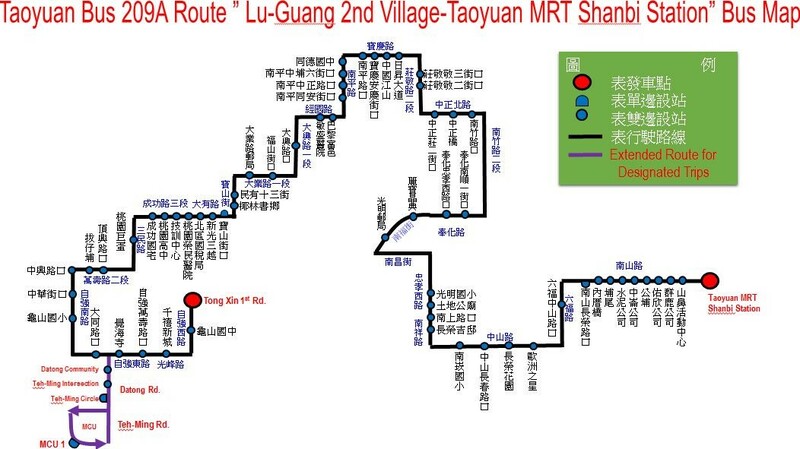 TAOYUAN BUS: No.209A “Lu-Guang 2nd Village-Taoyuan MRT Shanbi Station” Bus Schedule has changed. 2018/10/09 update. ØFor specific bus arrival times, please check a cellphone app such as “Bus Schedule in Taiwan” (Mandarin Only) or “BUS+”. ØIf you have any questions, please contact Taoyuan Bus Company at (03)361-8365.